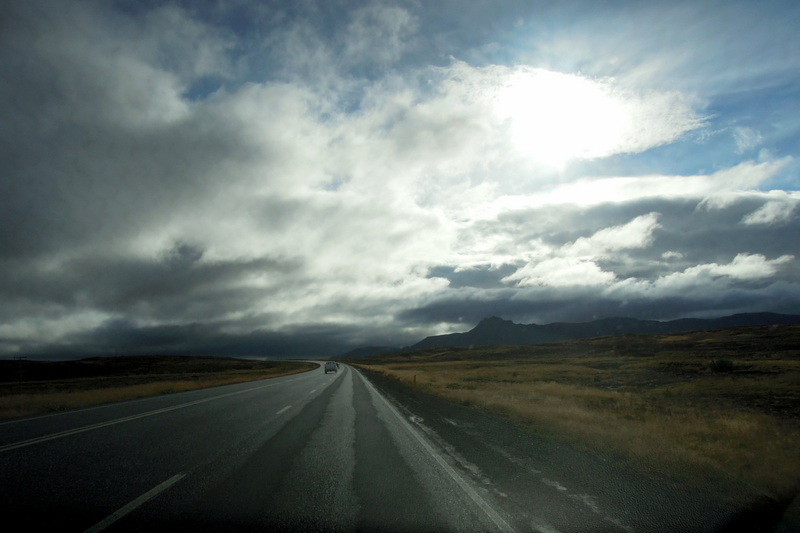 On the second day of our car rental in Iceland, we set out southeast-ward. 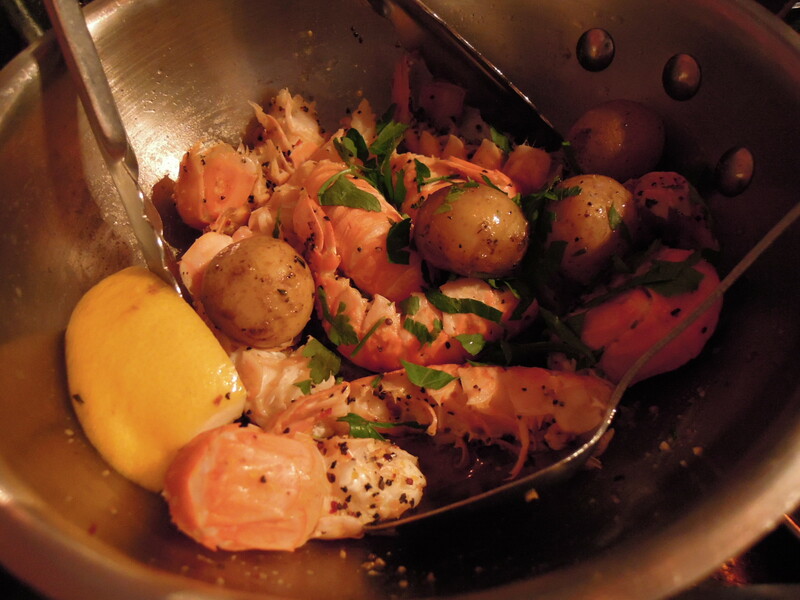 I’d read about coastal towns with good restaurants, so I thought we’d make for those. 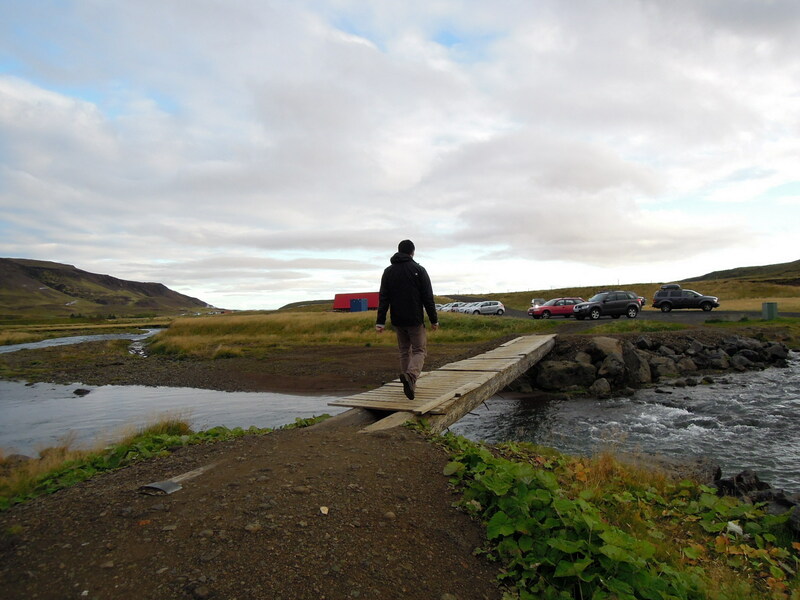 Along the way we would pass Hveragerði, a “greenhouse village” — the guide was somewhat vague on what that meant — so I figured we’d check that out too. We ended up spending almost our whole day there, with only the most cursory stop in one of the seaside towns! 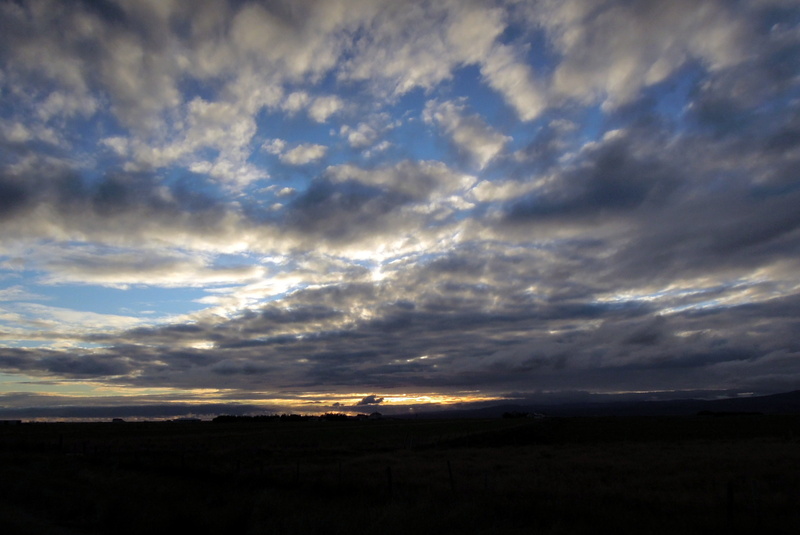 The day was a mix of overcast and sunny, with overcast winning out most of the time. 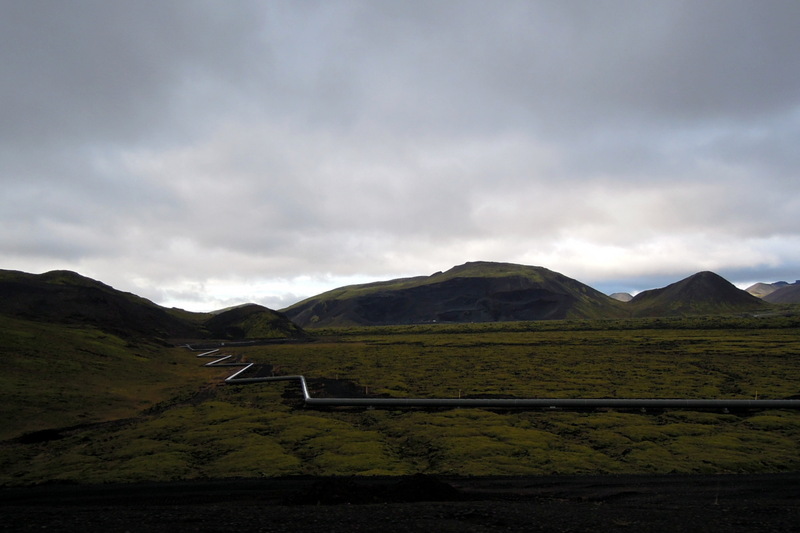 As I wrote yesterday, almost as soon as we left Reykjavík we found ourselves in a totally different landscape. The highway cut between hills which soon became mountains so huge they cut off the light from left and right. They loomed so darkly over us that I felt almost scared of them. “It must be some deep instinctive fear of big things,” I said to Erik, “that makes me think they’re going to jump up and eat us.” He confessed he was getting a little of the same feeling. The Mount Doom atmosphere only deepened when we saw huge billows of steam on one side — turned out we were passing a power plant. 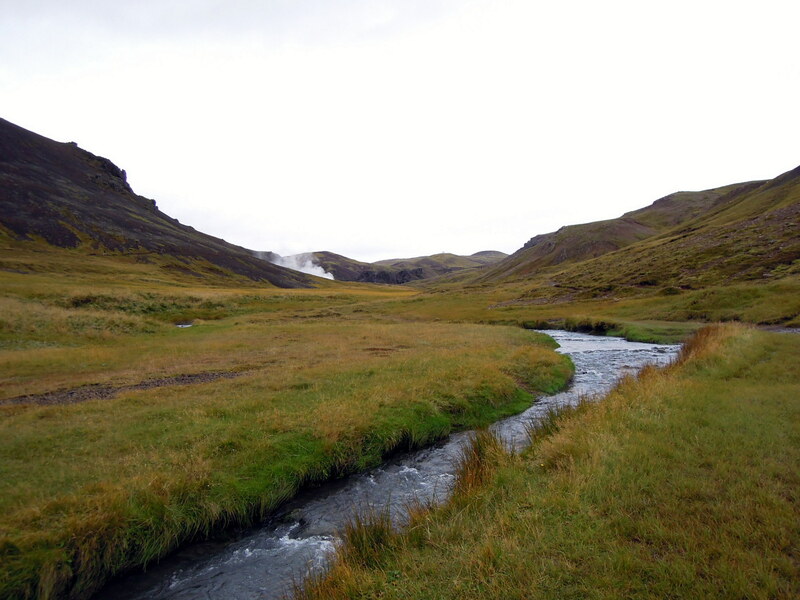 In about 40 minutes we reached Hveragerði, where we expected only to make a quick stop for some snacks. The town didn’t look like much from the highway, but when we turned in we found this delightful park. 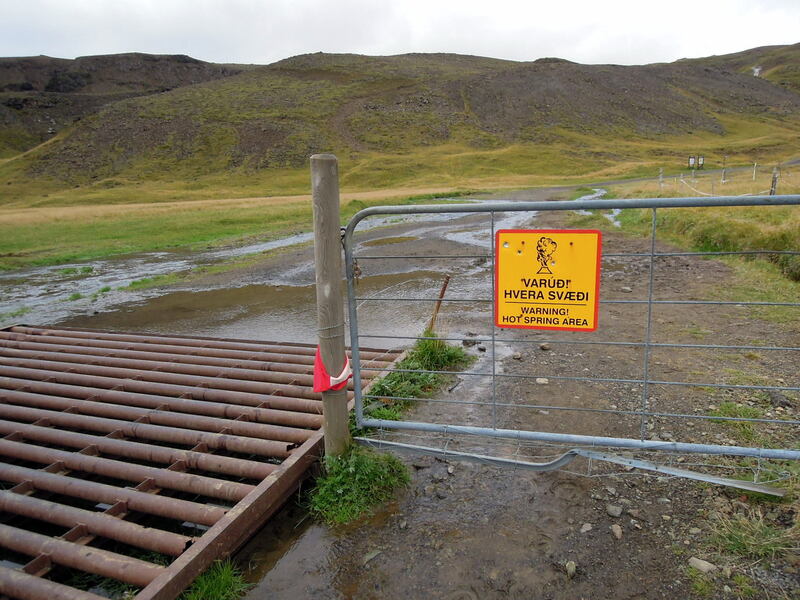 A sign said (in Icelandic and English) that it was created from designs submitted in a contest. 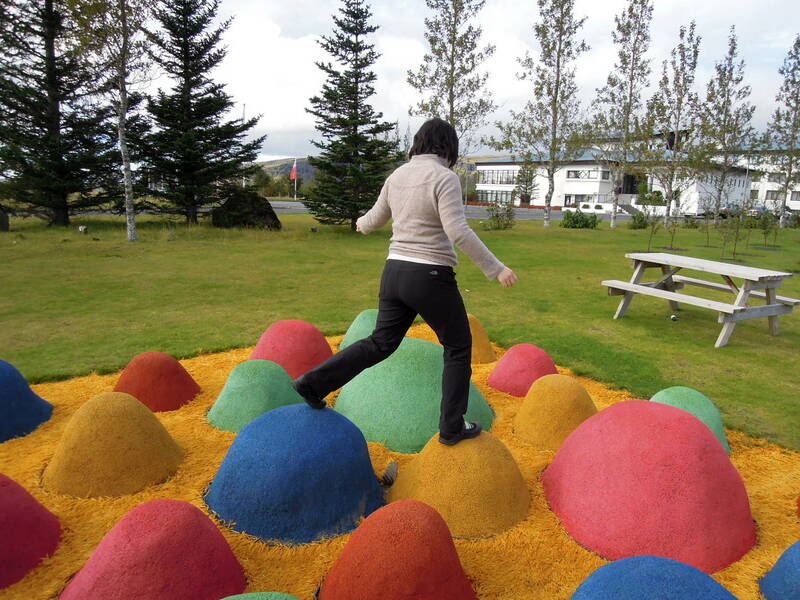 Of course I had to go step on those things. Next to the park were several greenhouses. We saw many of them around town, and in one we even saw bananas growing! 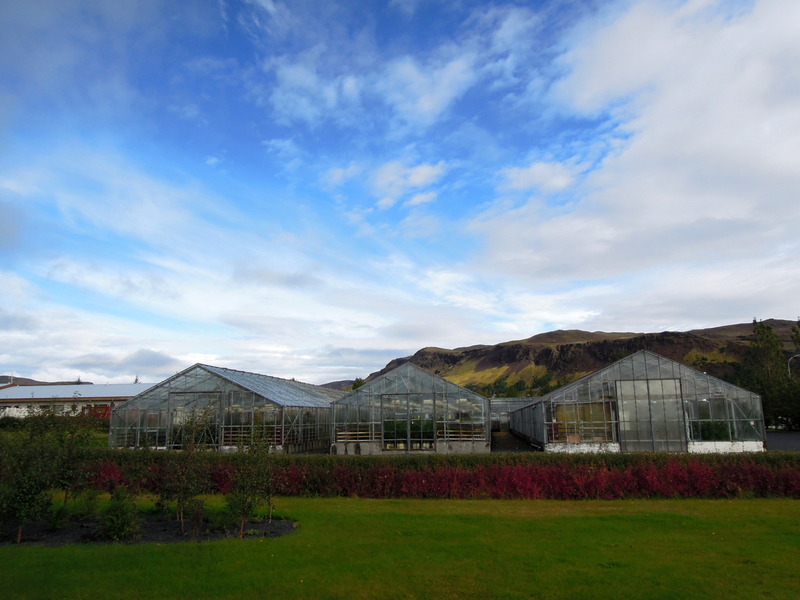 I know lots of Iceland’s produce comes from greenhouses, so I guess that’s what “greenhouse village” means. 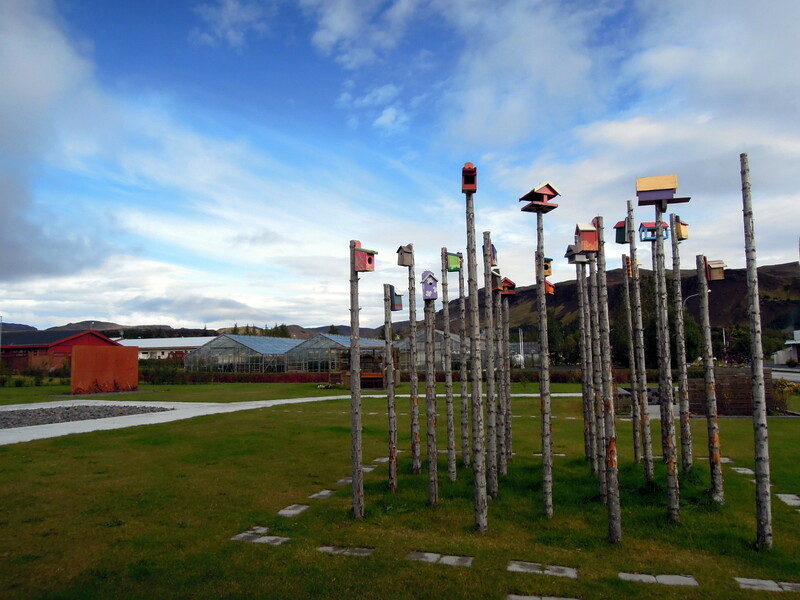 We got back in the car and followed a sign that said “Íslensk handverk/hand crafts.” There we found a little shopping center with a bakery, supermarket, post office, tourist info center, and a couple of boutiques (I tried some hand cream made with Icelandic herbs). At the tourist center I was pleased to find a free booklet with info about the town. 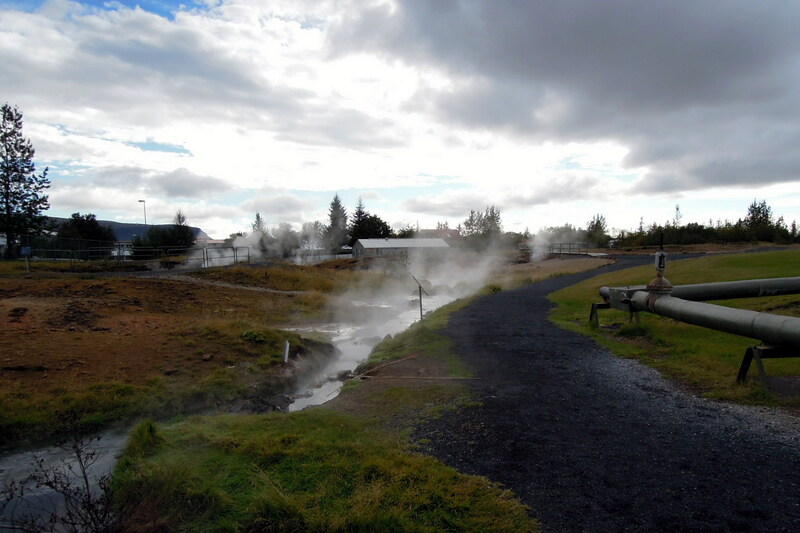 I perused it and became very excited to read that there was a park where we could boil eggs in a hot spring. And its visitors’ center closed for the winter on September 15, so we’d caught it on the last possible day! 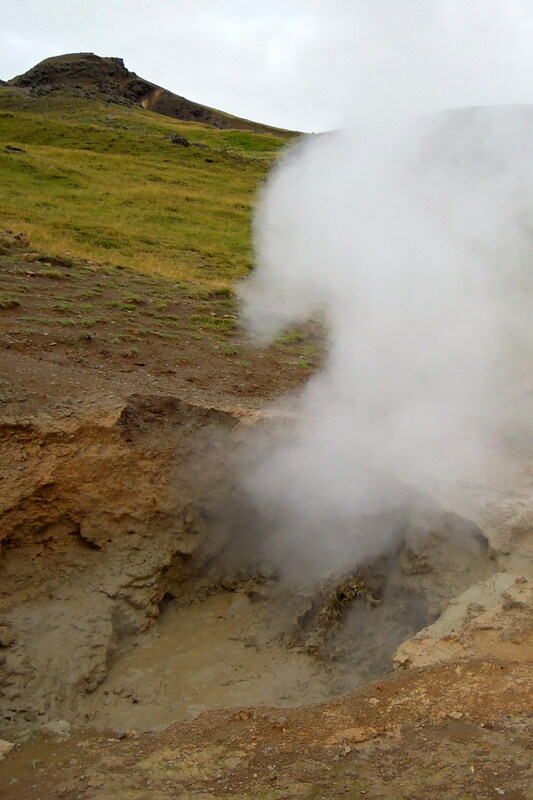 When I was very young, I read somewhere that there was a place where the springs were so hot you could boil eggs in them. There was a photo of some kids squatting round a steaming hole in the earth, lowering a basket of eggs into the water. I think the ocean was in the background. The image has stuck with me forever, so you can imagine my uncontainable glee when I discovered — entirely by accident! — that we now had the chance to do this very thing. “The spring is colder than usual right now,” the man said, “so it will take about 15 minutes. There’s a stream and you follow it to the end, over this bridge and that one, and there you’ll see a sign and a cooking pot.” He handed us each a bamboo rod with a cord tied to it and a little drawstring bag at the end of the cord, and eggs to put into the bags. 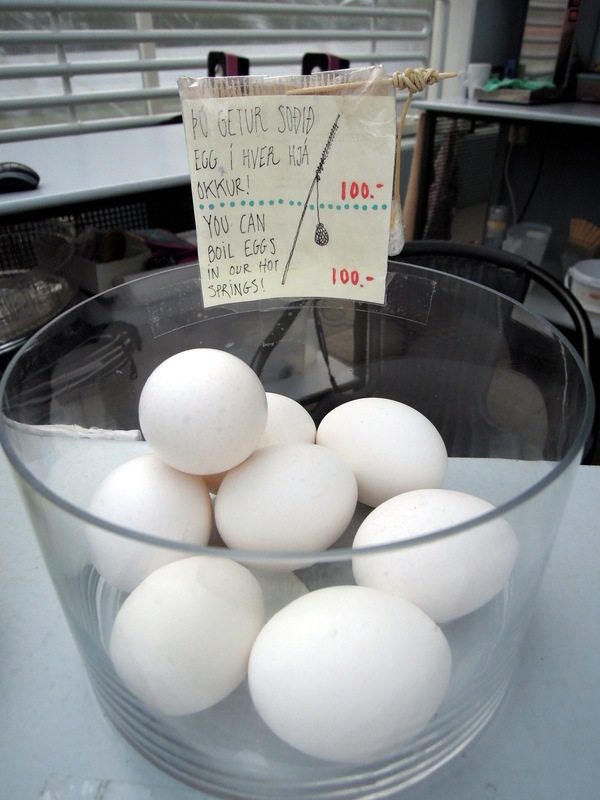 Sure enough, there was a sign saying this was the place for eggs, and someone had put a metal stockpot into the water. Not quite the same as a hole in the ground near the sea, but still perfectly exciting. Erik set his timer; 15 minutes gave us just enough time to stroll around and see the rest of the park. It was a friendly place with signs in multiple languages. Not as dramatic as what I remember of the hot springs at Yellowstone, but way less crowded — we were the only ones there. When we finished seeing everything, we returned to the egg pot. 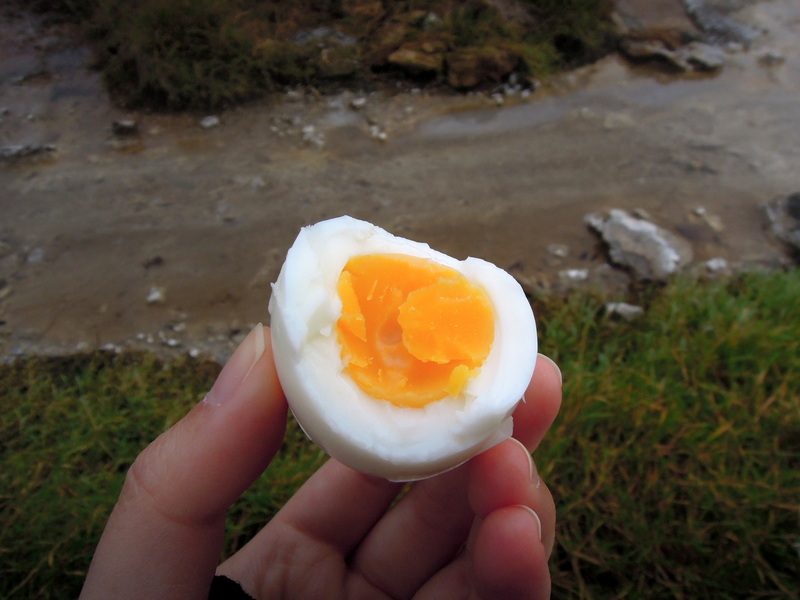 We considered taking our boiled eggs back to the visitors’ center — it was very cold out, in spite of the steaming springs — but ultimately decided to eat them outside. We crouched next to the stream and I spread a hankie for the eggshells. The eggs were perfectly delicious. When we brought the bamboo poles back to the center the man started to get paper plates for us, but then he saw the empty bags and said, “Oh, you ate them!” Heh. After that we went to a restaurant for a proper lunch (seafood pizza and a leek soup so creamy it was like eating béchamel sauce). 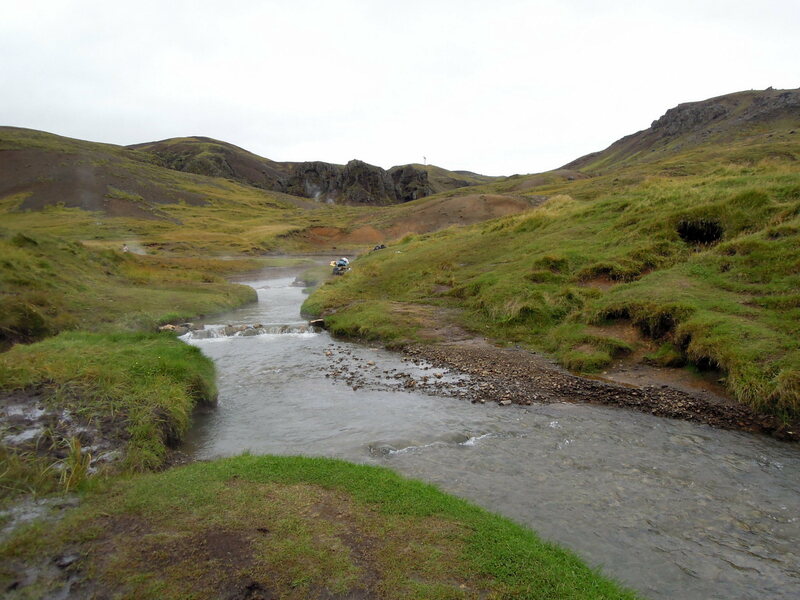 I kept reading the tourist booklet and saw that there was a place we could hike to and bathe in a hot river. 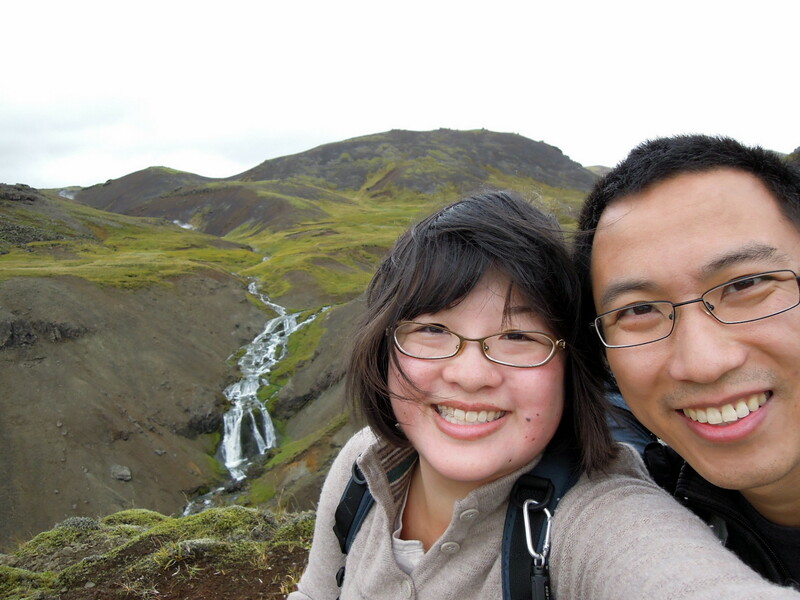 We’d brought swimsuits — there are community pools all over Iceland — and a hike sounded good after our big lunch. Once we found the road to the trailhead, though, we almost gave it up: the unpaved road was so full of potholes Erik said driving it was like “playing a video game.” In fact, we turned back the first time, but then decided to try again. It was a tiny road with almost no one else on it (and horses gazing at us from the pastures all around it), but when we reached the parking lot at the end, it was full of cars. There was even a café, and some clean public restrooms. We bundled up, I packed my suit and towel into my backpack, and I changed from street shoes into the waterproof boots I’d bought in Edinburgh. In the next few hours I was grateful about fifty times for those boots. 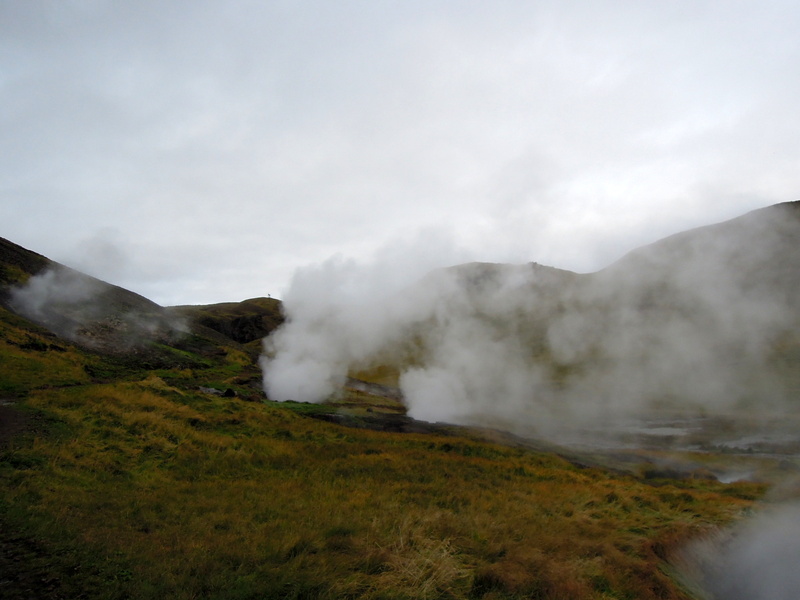 Even before we reached Hveragerði we’d been able to see some of the steam plumes rising from the earth — I learned that day that they’re called fumaroles — but here we walked right next to them. The earth was so many amazing colors, I wondered if I could crush the dirt into my palette and paint with it. I should have taken some home to try. 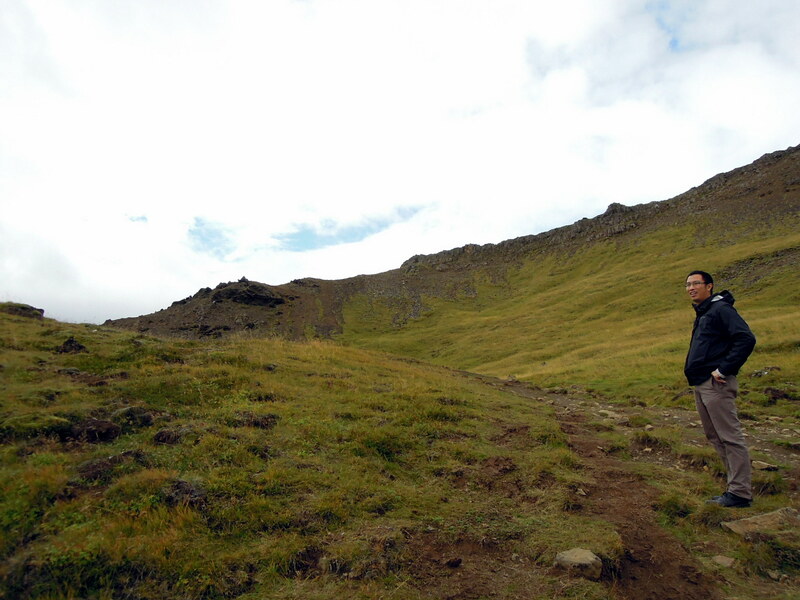 There were other hikers out — including several sets of parents and children — but it hardly felt crowded. There was so much space. And I imagine that even if we’d been standing shoulder to shoulder, front to back, with hundreds of other people (like at Menningarnótt), it would still have felt spacious: there was the sky, after all. 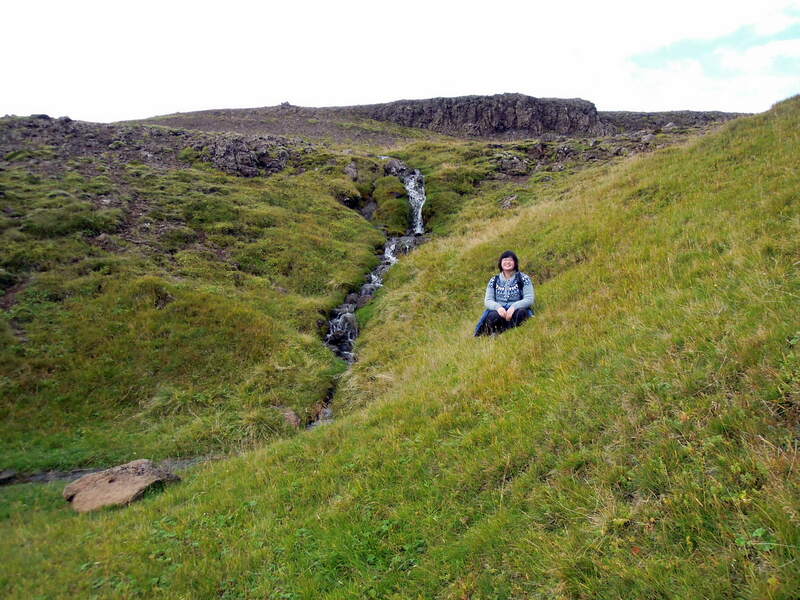 We went up the hills/mountains, stopping to take pictures or admire some particularly interesting spring or stream. We’d both forgotten to bring water… we were strongly tempted to drink from the streams, which looked as clean as could be, but we decided not to chance it. The same went for the berries we saw, which looked just like the crowberries I’d bought two weeks ago from a market. 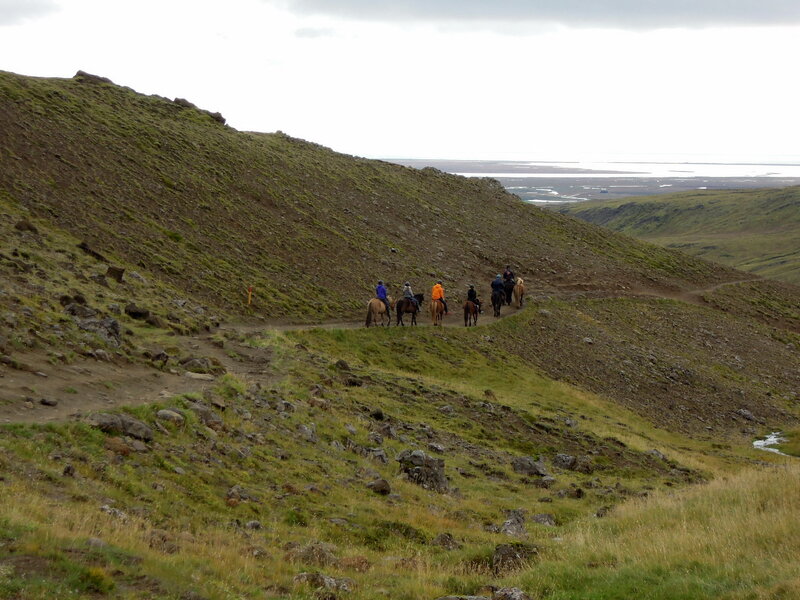 At one point there was a horse tour on the trail, so we stopped to let them go by. 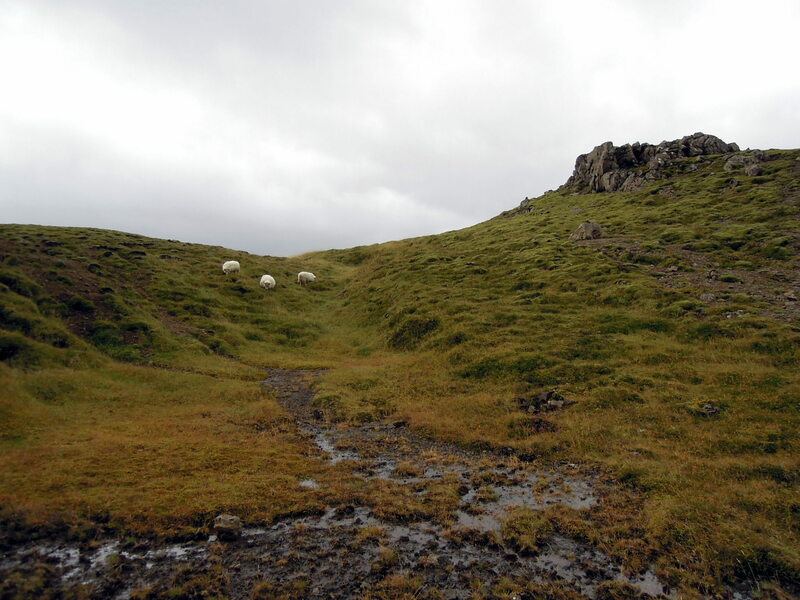 Everywhere we went, there were sheep on the hillsides. I read that in Iceland (as in New Zealand) the ovine population outnumbers the human. 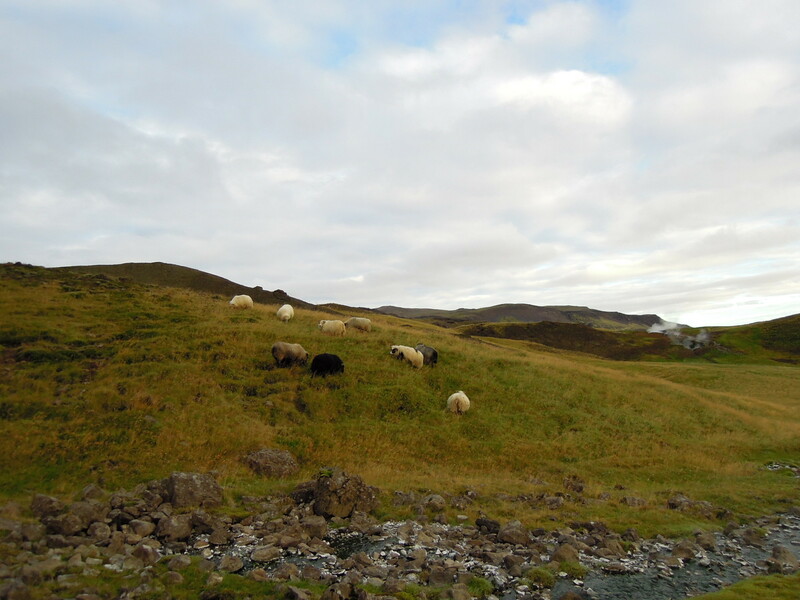 Icelandic sheep are very cute: fat and round, with straight wool instead of curly. (I found the genetic info on the Wikipedia entry rather interesting.) They didn’t seem as quick to run away as the sheep we’d encountered in East Lothian in Scotland, but I don’t think they cared much for us. 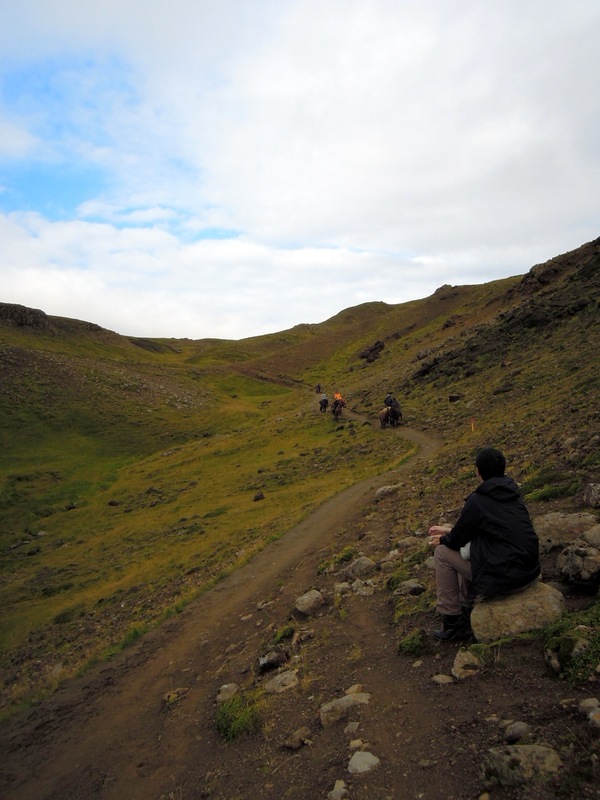 After we’d been walking for awhile, the trail swept upward in a dramatic curve. As we got closer, I also noticed that the ground below fell away just as drastically, revealing that we skirted a vast valley. 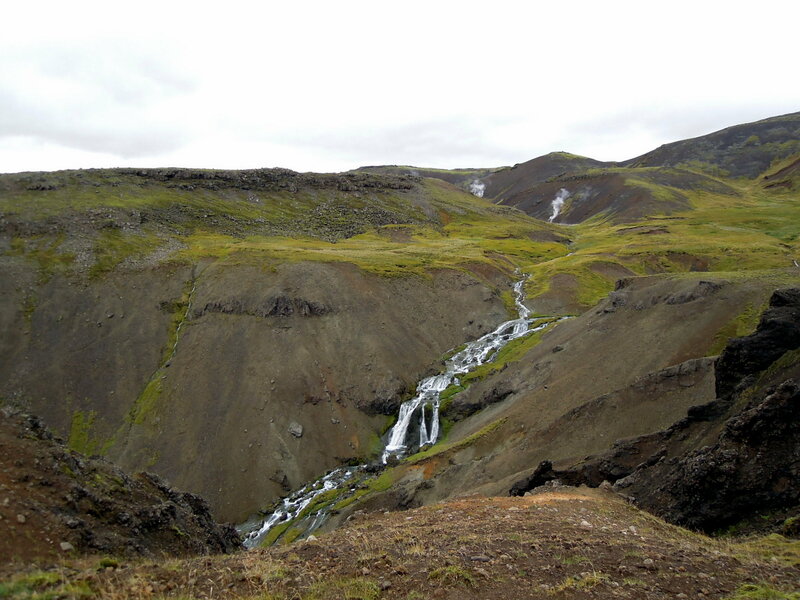 Around that curve we saw even higher mountains and an even more dizzying drop, highlighted in truly mind-boggling wild glory by the most stunning waterfall I’ve ever seen. We walked down as close to the edge of the cliff as we dared, and even that was a little too close — I actually stuck my hand out and grabbed the bottom of Erik’s jacket because I didn’t want him going any further. I didn’t even dare try to point my camera down for a photo (remember, there are earthquakes here). Then, buoyed by adrenaline, we took this picture. The other hikers we’d seen by the waterfall turned back here, apparently thinking this was enough. 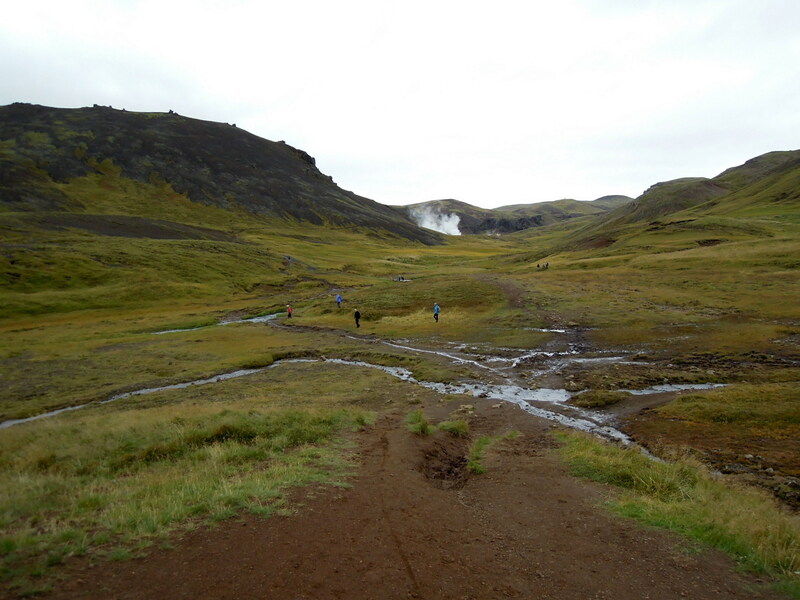 But we kept going — we hadn’t seen the hot river yet! 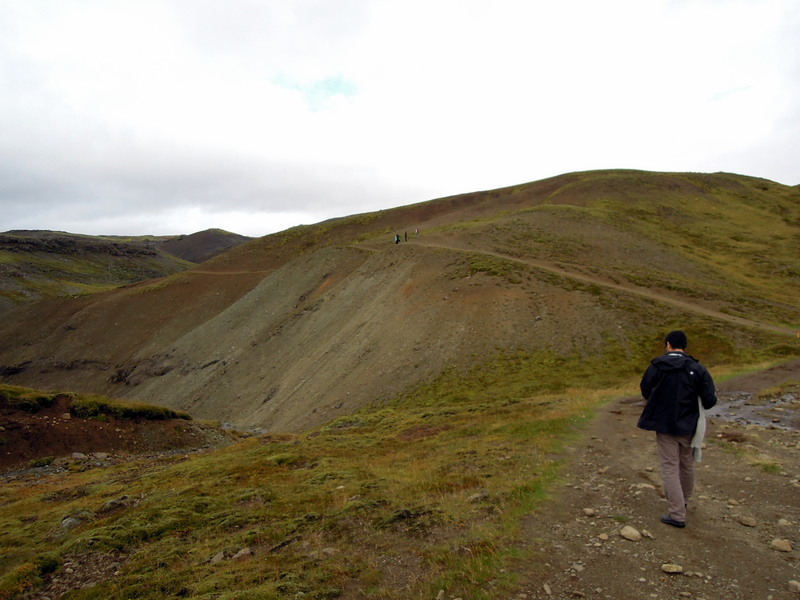 The trail turned downhill after this and came into a valley where many little streams converged. There were a lot of people around and we thought this might be the hot river. We actually spread our rain jackets and sat down on the riverbank, thinking we would dip our feet in. But the water proved to be only lukewarm. “Is this the ‘hot’ river?” I wondered. There were no signs posted so we couldn’t be sure. 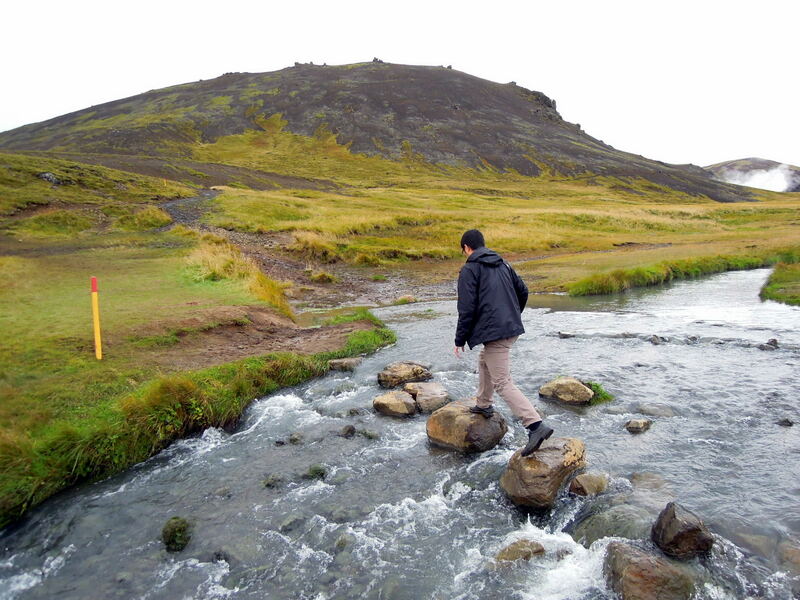 We decided to keep on, though the ground around the water was soggy and it seemed there was no way to cross except to use the rocks. Once we got out the trail was still quite muddy, and in one place the mud was so soft my right foot sank all the way up to the ankle. Yay for waterproof boots — I only got one little splash on my sock. From here the trail followed the river. I took a panoramic photo — you’ll want to click on it so you can see the whole thing, since this little version doesn’t really show you anything. 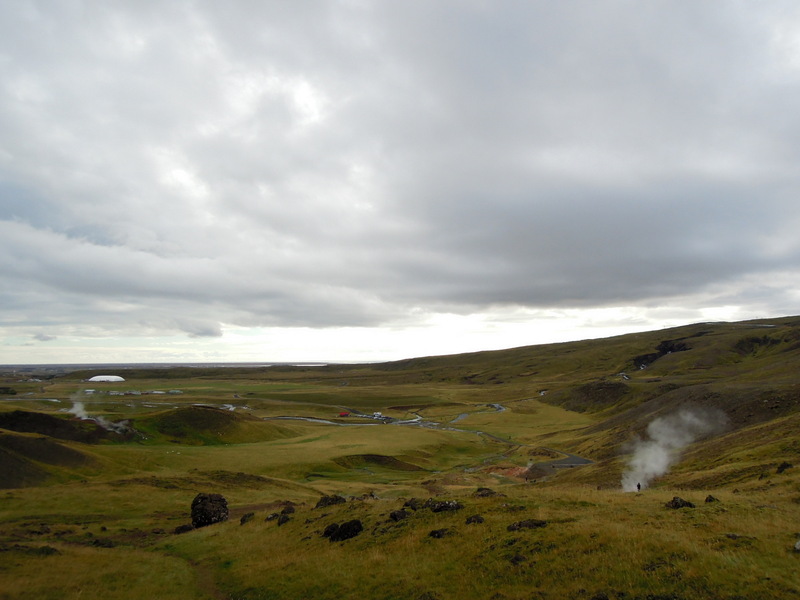 The hot springs became more prominent here too. 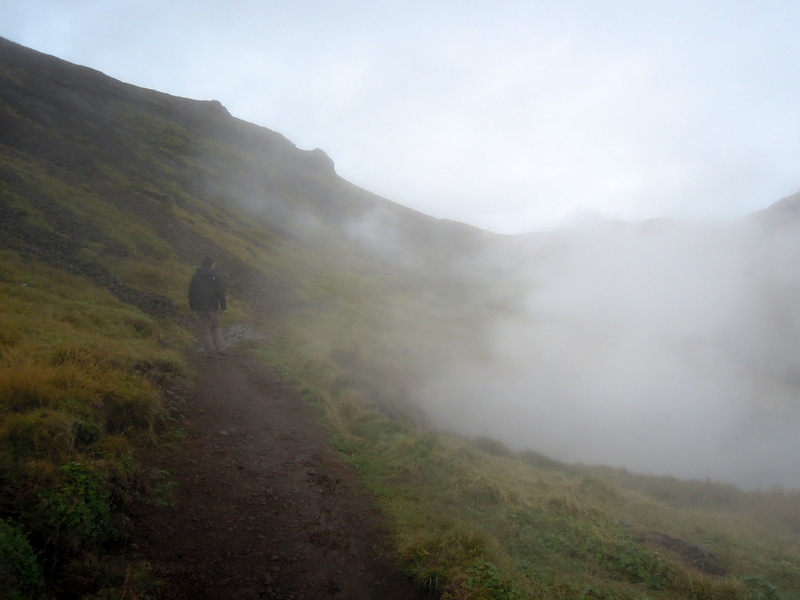 Much of our walk was shrouded with steam and a peculiar acrid smell (with a hint of sulfur, of course). We tromped through the mud as the wind blew steam in our faces. It felt like very fine warm mist. In one place where the water boiled and bubbled I wanted to take a video to show you how it looked and sounded. Some of that noise you hear is the wind, but when it dies down you can hear the sound of the spring. Finally, where the mountains cleared away a little, we saw a widening of the river, with some colorful clothes and backpacks along its banks, and people stripping off their clothes. We had arrived at the hot river. There was a naturally inviting-looking bathing area where multiple streams converged, and there was even a semicircle of rocks piled up in the river to form a sort of hot tub. The atmosphere was warm and cozy, almost like some neighborhood bathhouse where everyone knows your name. I stripped right there to change into my swimsuit, and I noticed other people doing the same. It felt completely natural and not at all weird. I didn’t take wide photos of the bathing area because that seemed disrespectful to the feel of the place and the privacy of the few people taking off their clothes at any given moment! But Erik — who didn’t get all the way in, because he doesn’t like very hot water — took some photos of me. The water was deliciously hot — just this side of bearable — and though it wasn’t very deep and the rocks were uncomfortable to sit on, I stayed in the river for a good long time. I looked at that clump of earth and plants next to me and admired the way a tiny ball of mud was suspended from the larger piece by a few strands of the grass that had grown on it. 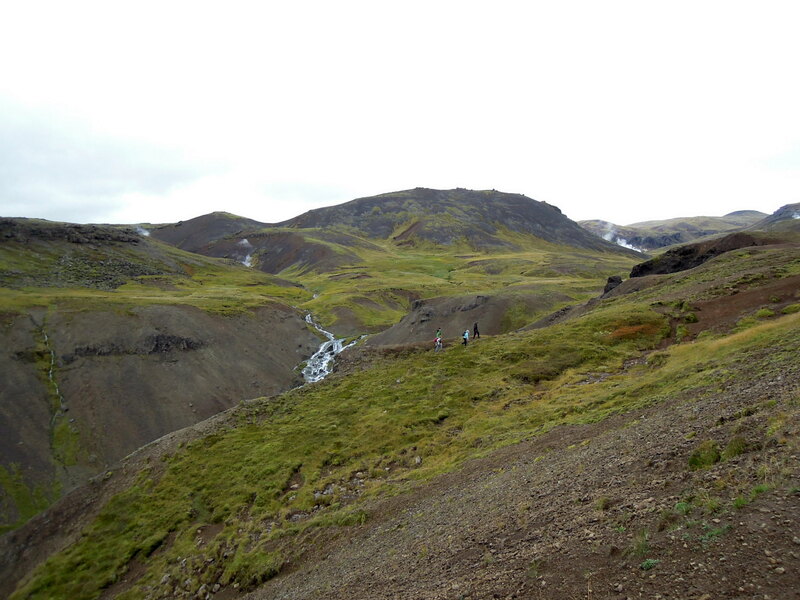 There were so many different plants on that little piece of earth, and so many shades of brown and green. Water droplets dotted the whole. 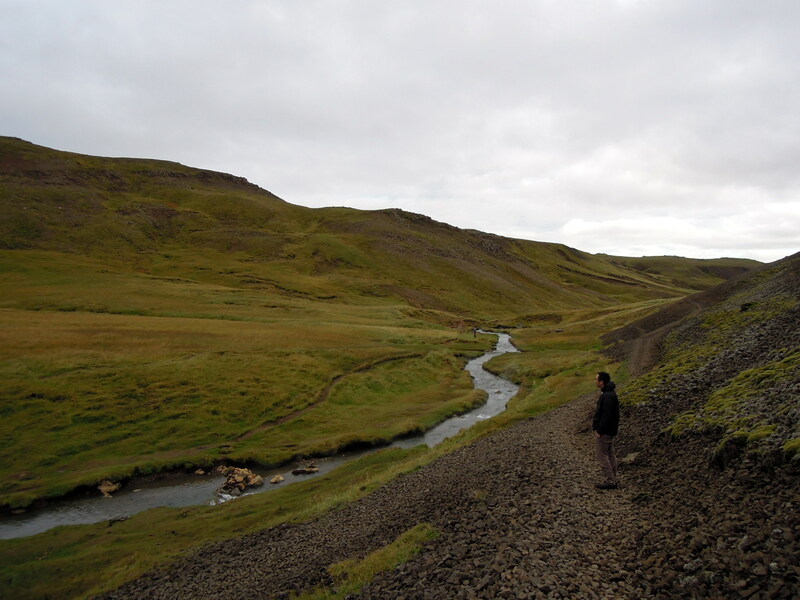 I thought, “even if you built a hot tub and set rocks and plants next to it to make it look like Iceland, it wouldn’t look like this.” I picked up a couple of the rocks from the river bottom and looked at them. They were red and brown. It was like the best hot tub ever — and no chlorine. I chatted a little with a nice Chinese woman, who was there with her grandson, her daughter (? ), and her brother and sister; she told me she’d immigrated to Sweden twenty years ago and had moved to Iceland just last year. I explained that my Mandarin isn’t very good and she said, “Same as him” (pointing to her grandson). “But his English is very good.” I noticed she spoke to him in English sometimes and Swedish other times. (I think it was Swedish anyway. It didn’t sound like Icelandic.) A fit-looking middle-aged Finnish man stripped down and got in, and tried to persuade his wife to do the same. She was much more hesitant but finally joined him, carefully changing into her tankini top and bottom so her body was never fully revealed. 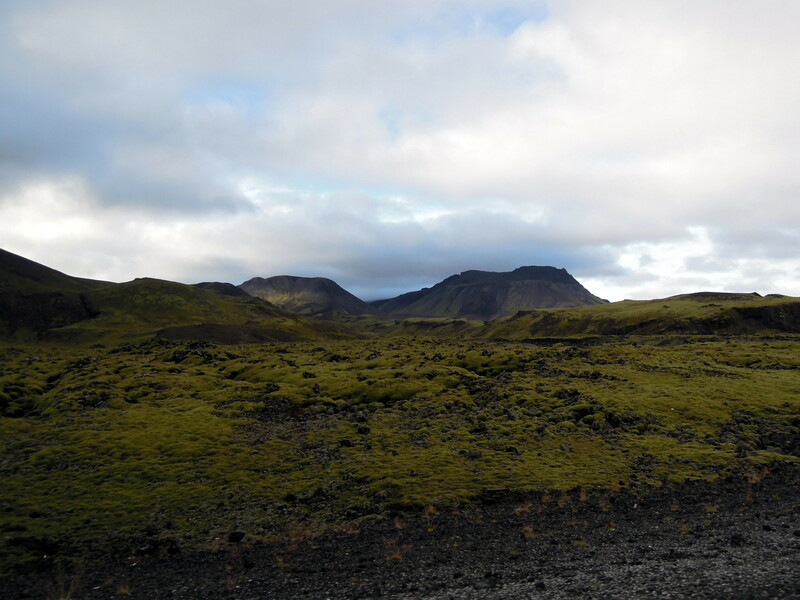 A trio of Icelandic men — an older man, a young one, and a little boy — approached and got in one by one: first the little boy, then the older man, and finally the young one. One of the men — I can’t remember now whether it was one of the Icelandic guys, or the Finnish man — held up a camera and laughed to his companion(s), saying something that sounded like “veiz bok” (Facebook, I take it). Finally I was about as warm as I could stand, and the hike back wasn’t getting any shorter. 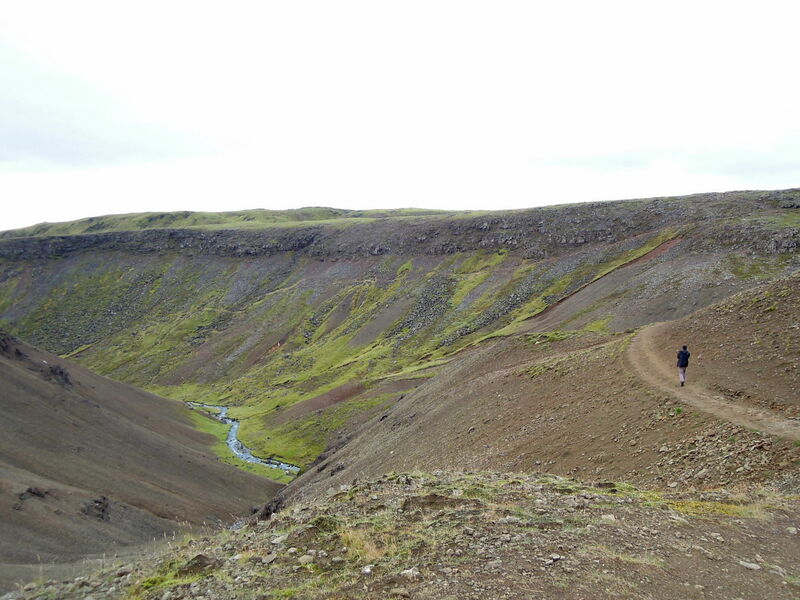 I hopped out and stood rummaging through my backpack for my towel, thinking, “I’m standing wet and practically naked in the mountains of Iceland and I’m not cold.” I was, though, by the time I dried off and put my clothes back on. (It didn’t help that my pants had gotten some water on them and were now cold and wet.) I put on every article of clothing I’d brought with me — including my hat and handwarmers — and urged Erik to walk with me as fast as we could. When I think now about the 3.5km walk back to the parking lot, it feels like a blur (except for when I stopped to pee in the shrubbery). I’d like to say this is because I was in a warm, cozy, post-hot-river state of languor, but actually I suspect it was probably dehydration… no matter! As we got closer to the trailhead I noticed some sheep had come down closer to the trail, so I climbed a little way up the hill to take their picture. After hopping those rocks in the stream, and wading through mud and sitting in the hot river and finding a place to pee behind a hillock, clambering over a streambed and a small hill felt like nothing! I was so happy to see the parking lot. 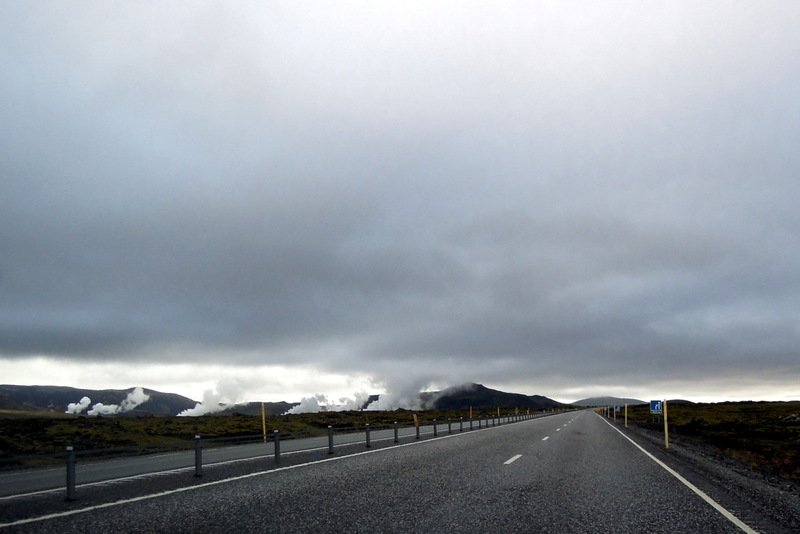 We made our slow, bumpy way back over the pothole-ridden road, drove through Hveragerði, and then finally headed over to one of the seaside towns for dinner. We arrived just as the sun was setting over the ocean. I have to say we barely had eyes for it. Weary, very thirsty, sleepy, and hungry, we ordered more langoustines and soup than you can shake a stick at. That is amazing and so otherworldly that I fear I would have an anxious reaction even after the looming mountains weren’t on either side. But then you describe it as so open, maybe not. Love this. Thank you, Jenny! 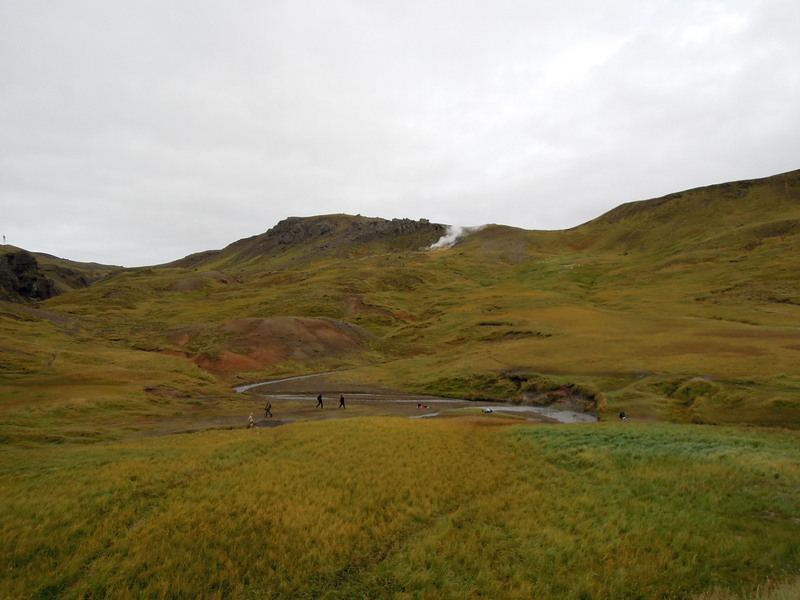 Yes, it’s really otherworldly — I think I’m actually acclimated to Iceland’s insane natural beauty since we’ve been here more than a month now, but places like the hot springs still make me gape in wonder. Somehow I did feel really safe in these mountains (compared to the ones we drove through), especially in the area with the hot river. I have no explanation for this, but it was a really good feeling. I would think that after sitting in that hot river for awhile you would be as relaxed as a wet noodle. Didn’t you want to just stop and curl up for a nap, perhaps next to one of those cute sheep? 🙂 Anyway, lovely adventure — an dthe egg looks yummy. Thanks for reading, Diana! You should go explore! Even if you have to stay close to home there’s still tons of cool stuff in CA. 🙂 We used to go up to Marin County whenever possible and just drive and ramble around there. I feel like we’re doing exactly the same thing now, just with different scenery (and different roadside snacks)! Oh yay 😀 That’s the goal with these posts! (BTW, I started out trying to limit the number of photos per post to 20. Then 30. Now it’s 40. ;b ) Thank you for reading each and every tiny detail!! Yes! Clean air and water and everything. 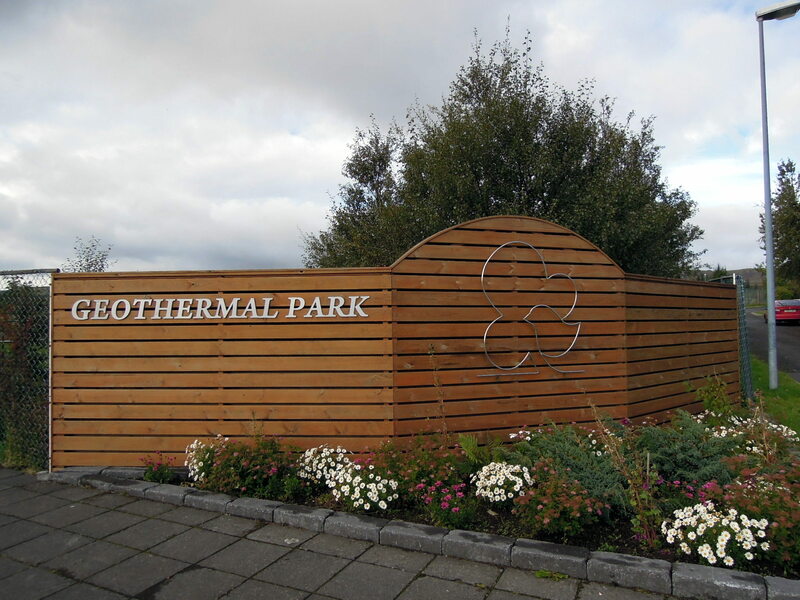 It helps that the population is very low (the entire country has 75% of the population of Edinburgh — our previous stop — which is itself not a big city) and that a huge percentage of their energy comes from geothermal and hydro- power. All the food we’ve eaten here has been very tasty and mostly quite fresh (distribution channels must be quicker) even though I’ve heard chicken and pork is still factory farmed. 😦 (There are free range eggs, though.) The money is krónur (singular: króna) and it’s about 120 kr to $1 USD. Apparently after Iceland’s recent financial crisis, the króna fluctuated so much that many countries don’t stock it at their currency exchange. Thank you so much for sharing your creative writing talents and picturesque / personal photos. 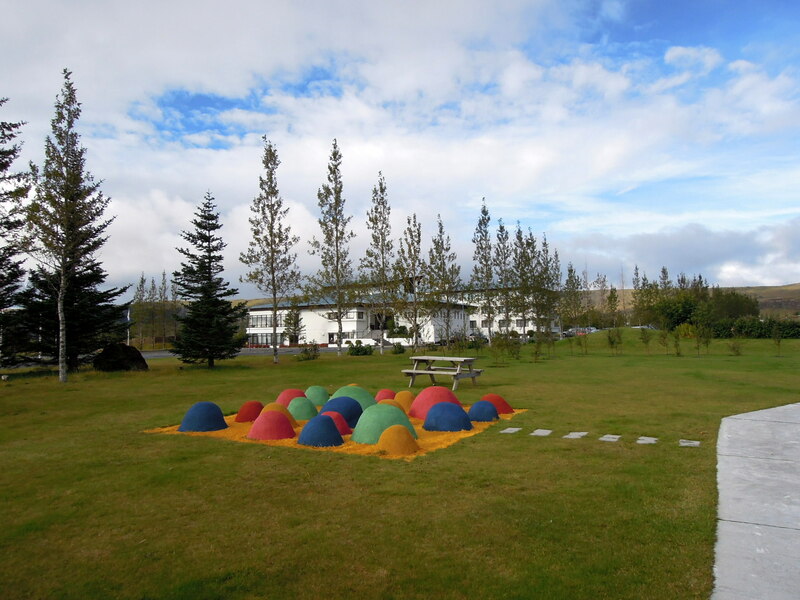 I am going to Iceland next week and am going to go inside the thrihnukagigur volcano along with the golden circle whole day tour, puffin island, south shout adventure tour and blue lagoon. I have waited six decades for this, so I’m not up to doing some of the exciting, adventures you have shown, but I want you to know how much fun it is for me to read your blogs. Thank you. Thank you very much for visiting and taking the time to read and comment, Jane! I truly appreciate your words; so often I have no idea who might be touched or helped by my words and pictures. 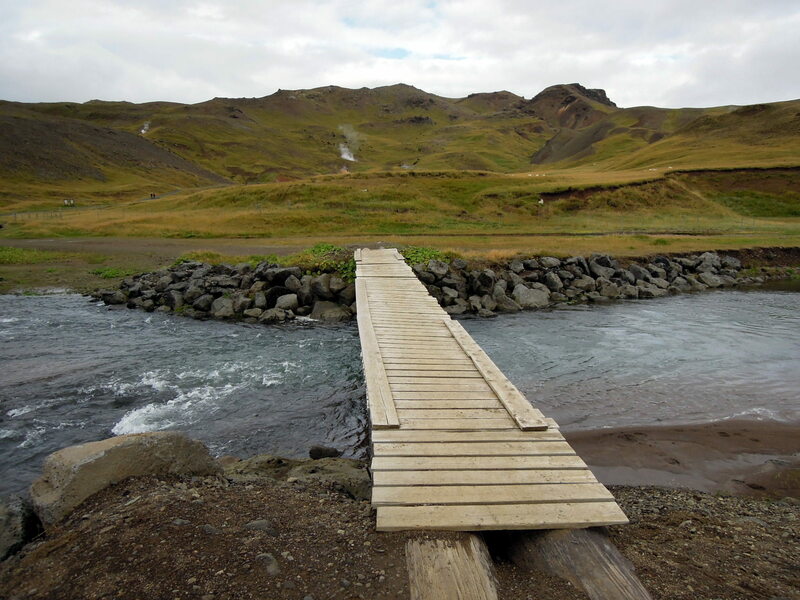 Have a wonderful stay in Iceland; it’s an amazing country with so much to offer. I’m sure you’ll find it was worth the wait (wow!). 🙂 Thank you again, and safe and joyous travels! Nice to see you made the hike all the way to the hot spring and hadd a dip, Lisa. 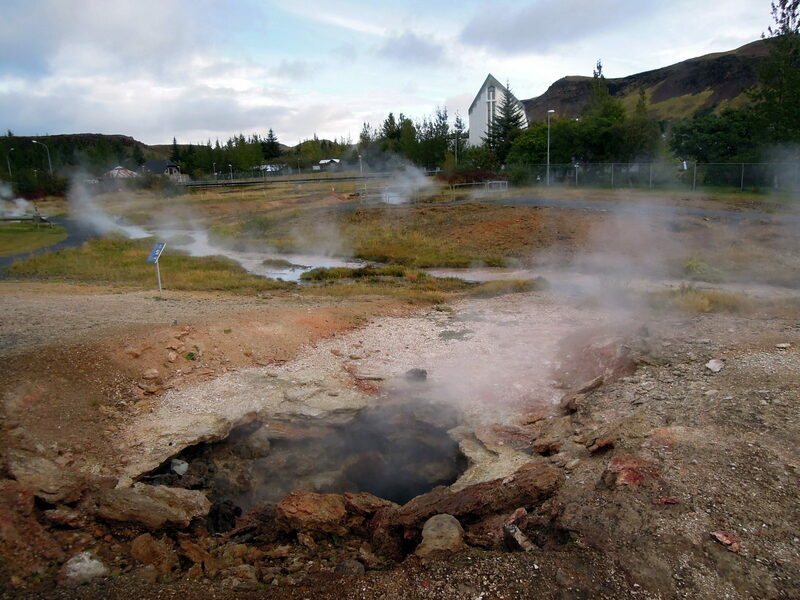 A shame when people come all the way to Iceland and does not take a dip in any of the multitude of hot springs we have here. 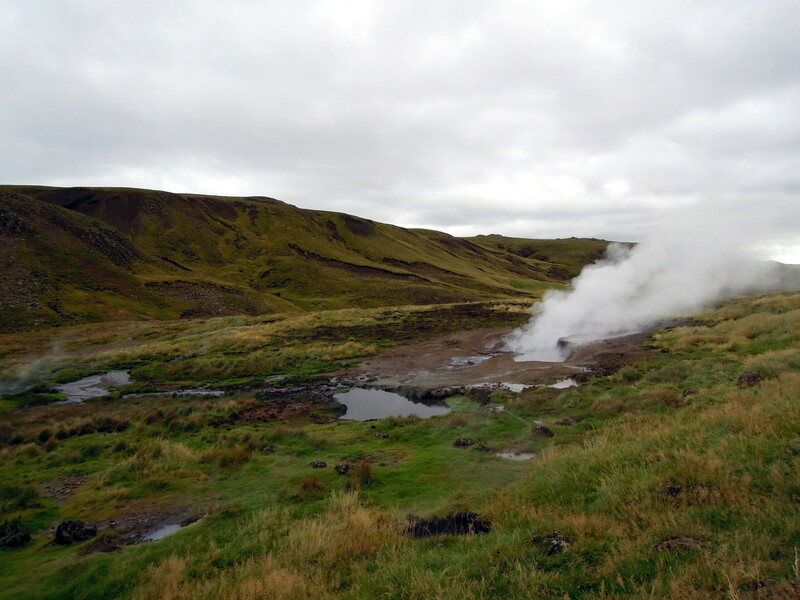 To help our guests, we wrote a blog about a few hot springs in Iceland, with information and GPS coordinates. Decent to see you made the climb the distance to the hot spring and hadd a plunge, Lisa. 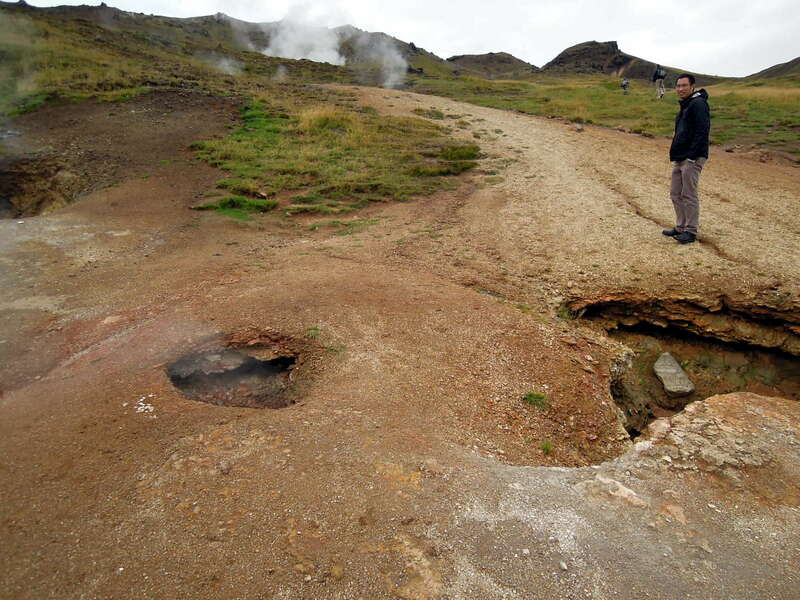 A disgrace when individuals come the distance to Iceland and does not take a dunk in any of the huge number of hot springs we have here.